P-a-SiC:H is suitable material for the development of optoelectronic devices. However, its chemical structure is complex, and its optoelectronic properties depend strongly on plasma stochiometry. In that sense, optimisation of the alloy characteristics is a fundamental step previous to the preparation of a-Si:H solar cells, since a high optical transmittance and electrical conductivity are required. In this work, a detailed study of the effect of deposition conditions on the properties of p-a-SiC:H was carried out. 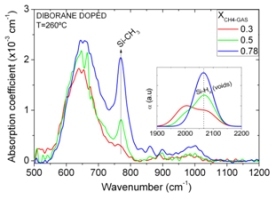 Diborane molecule presented a better doping efficiency, but the improvement on the p-a-SiC:H electrical properties saturated for concentrations RDB=[B2H6]/[SiH4]=0.01. On the contrary, trimethylboron allowed obtaining a higher optical transmittance and gap energy. A clear correlation between carbon content and alloy structural disorder was found. This fact explained the deterioration of its electrical characteristics with a high methane concentration, XCH4-GAS. The strong influence of the XCH4-GAS value on the p-a-SiC:H structure quality was used to improve its optoelectronic properties at low deposition temperatures (T<150ºC) without hydrogen dilution.